Where do we start? There are so many great Italian dessert recipes and finding an authentic dessert recipe has been made much easier with the advent of the internet and people like Mamma sharing her trade secrets with her readers. When adding some of these recipes to Mamma’s website, we never realized how many dessert recipes she has stored in her memory. 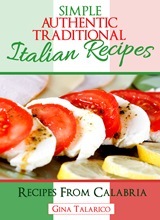 We have added a few and we are hoping to add many more….Mangiare and please share this site with your loved ones. Pane di Pasqua is a sweet Easter Bread and with Easter just around the corner we are delighted to highlight this recipe again. It is a bread and also a dessert. Donuts – I know matto, matto what are donuts doing on an Italian Recipe site…Mamma’s friends have been asking for it so she obliged.